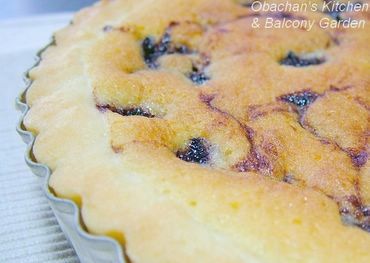 Baked Blackberry Tart... Where are the berries? 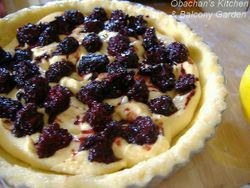 My original plan was making an easiest version of blackberry tarts, i.e., store-bought tart shells + custard cream + fresh berries. However, I learned a lesson this summer: I need to be careful when making desserts with fruits that are not completely ripe. So I tasted a little bit of the berries, and, even without looking into a mirror, I knew I had a frown on my face. No sweetness, no flavor, no-nothing. But the ones at the bottom of the container were already going moldy. So that was the reason why they were on sale. Oh well-- supermarket strategy. 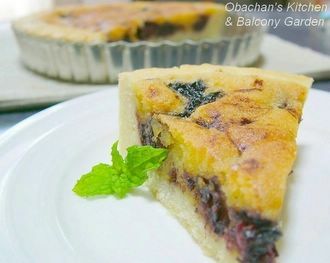 Anyway, I thought that the blackberries I bought would taste better when baked into sweets, so I finally chose a recipe of baked blackberry tart with almond cream filling. It involved cooking the berries with maple syrup beforehand, which sounded like a “safe” idea to me. Taste-wise, I think I liked it, even though I overbaked it a little. But I seem to have a bit of trouble with seeds when eating desserts with blackberries or raspberries baked into them. I had to bite the seeds when I least expected it, and it was a little annoying, to be honest. They may be shy but that makes them even more exquisite! Look great. I am always so impressed by your concerted baking efforts! And the new (used) camera is being utilised brilliantly too. Hi, too bad those shy berries...! I wouldn't say so about the picture, it looks delicious! I’ve just started my own blog - TastingLife. 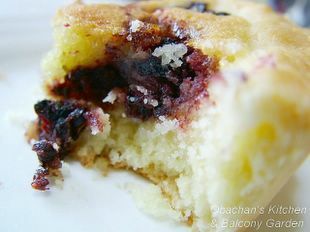 One of the reasons why I keep baking is that cakes are rather expensive around here … and they usually have typical Japanese cakes only -- you know, light and airy ones.